Auschwitz The Memorial, Oswiecim The Living Town : The Picture Show Most tourists, who come in buses to the former Nazi prison camp for the day, may not notice the people living in the surrounding towns. Each year, more than 1 million tourists visit Auschwitz to remember the equal number of people who died there. But, according to a recent AP story, "Auschwitz is crumbling — the world's most powerful and important testament to Nazi Germany's crimes falling victim to age and mass tourism." Officials have recently redoubled efforts to raise money for restoration, and the Auschwitz-Birkenau Memorial and State Museum has proposed its plans for revitalizing its exhibitions. But beyond the ghostly gates of the Auschwitz memorial is a living town — Oswiecim in Polish (Auschwitz in German) — home to some 40,000 people, living in the dark shadow of Holocaust history. Many tourists come in buses to Auschwitz for the day and may not notice the people who live in the surrounding towns. "Those who do notice," Danny Ghitis writes on his website, "a nearby shopping mall, high school sweethearts holding hands, nicely dressed families are headed to church — are faced with an impossible question: How can life exist in the aftermath of such overwhelming evil?" 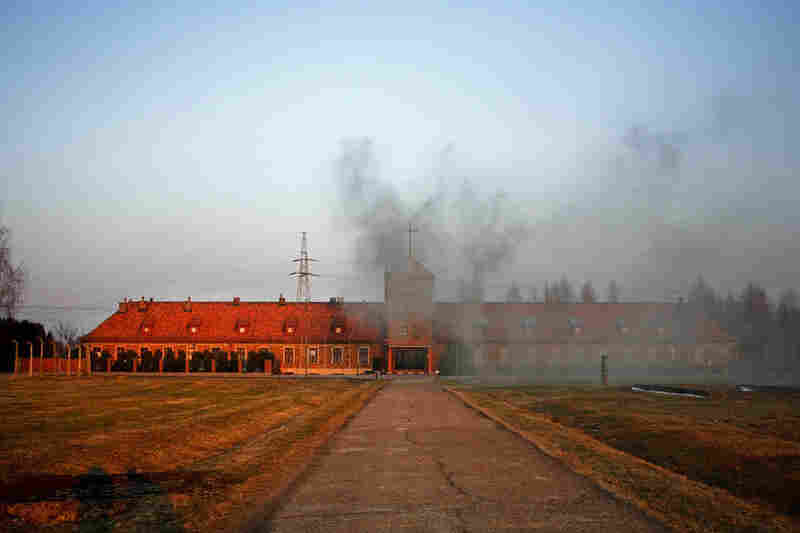 Coal smoke billows from the former main entrance to extermination camp Auschwitz II-Birkenau, which is now an active Catholic Church for the village of Brzezinkau ("Birkenau" in German). A girl skates along from the adjacent village of Brzezinka to the town of Oswiecim ("Auschwitz" in German). The road separates farmland and houses circling the camp museum. A tourist at Auschwitz II-Birkenau sits at a tour bus in the parking lot by the entrance. 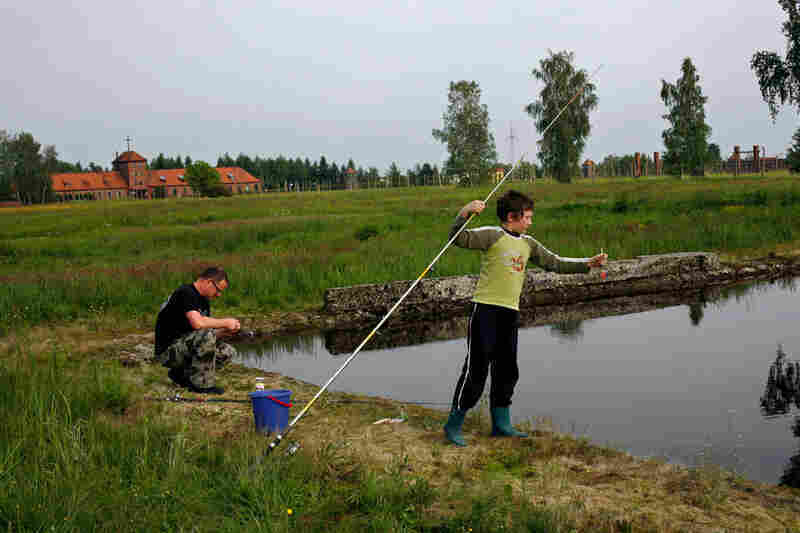 A father and son from the town of Brzezinka go fishing in flooded ruins of barracks at Auschwitz II-Birkenau. 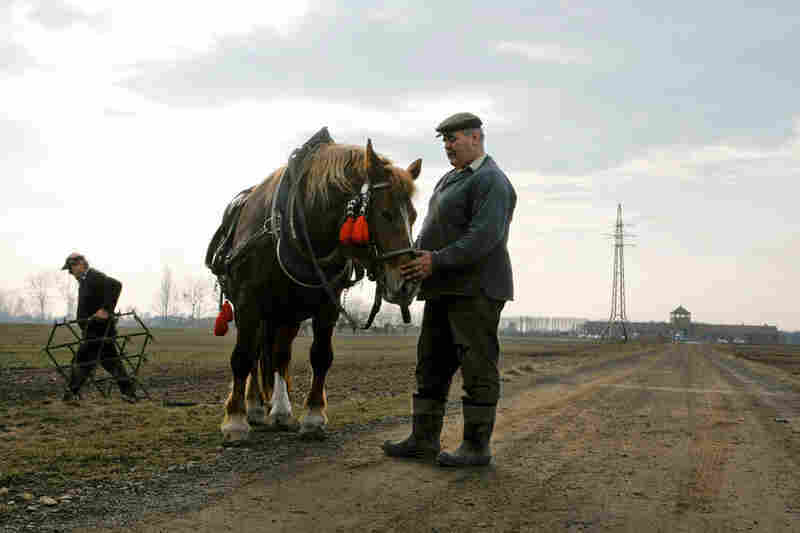 A farmer releases the reigns from his work horse after plowing his field in front of the Birkenau "death gate." 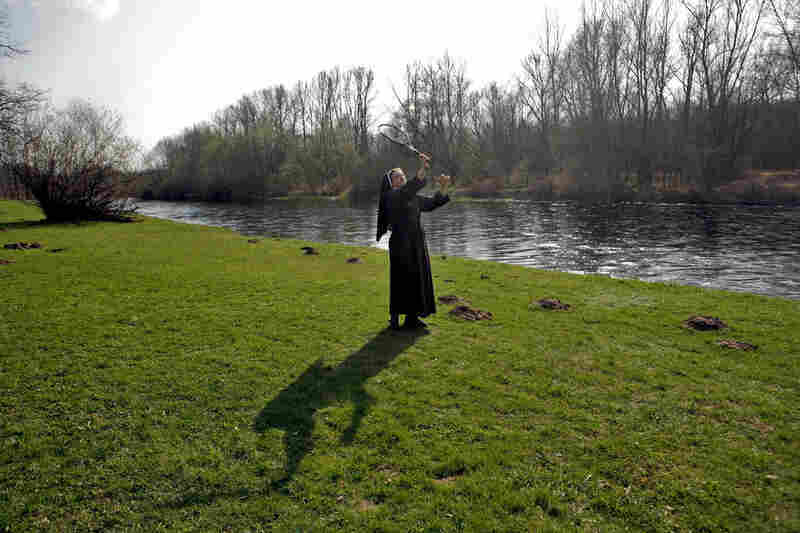 A nun plays badminton with school children on the banks of the Sola river in Oswiecim. About a mile down the river lies the concentration camp Auschwitz. 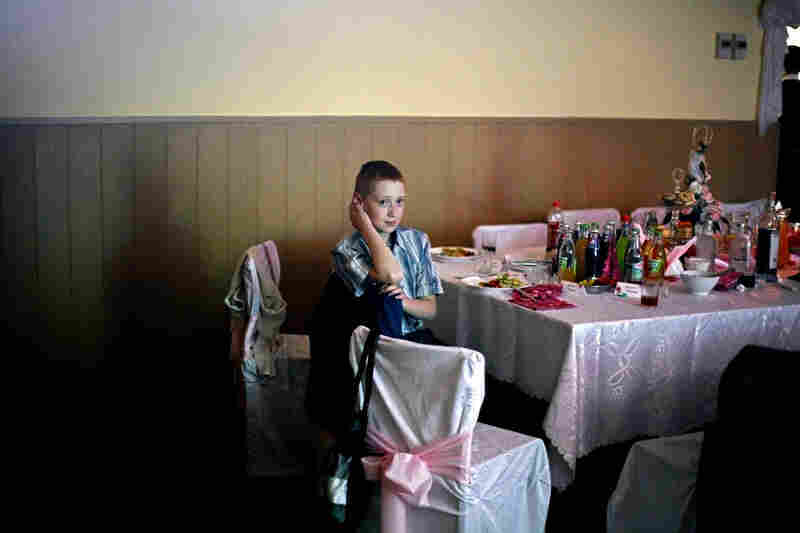 A young boy at a wedding reception above the firehouse in the village of Brzezinka. 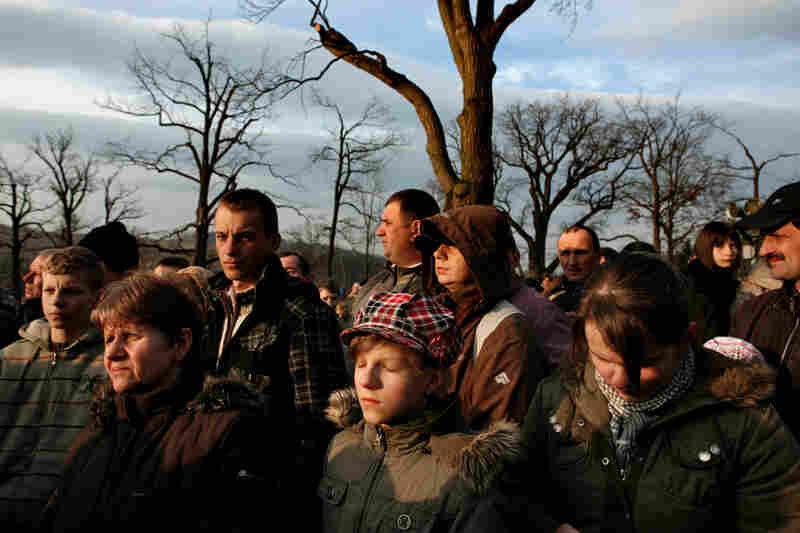 Catholic pilgrims pray on Easter at a holy site about 30 miles from Oswiecim. Poland, which was ethnically diverse before WWII, is now about 95% Catholic. 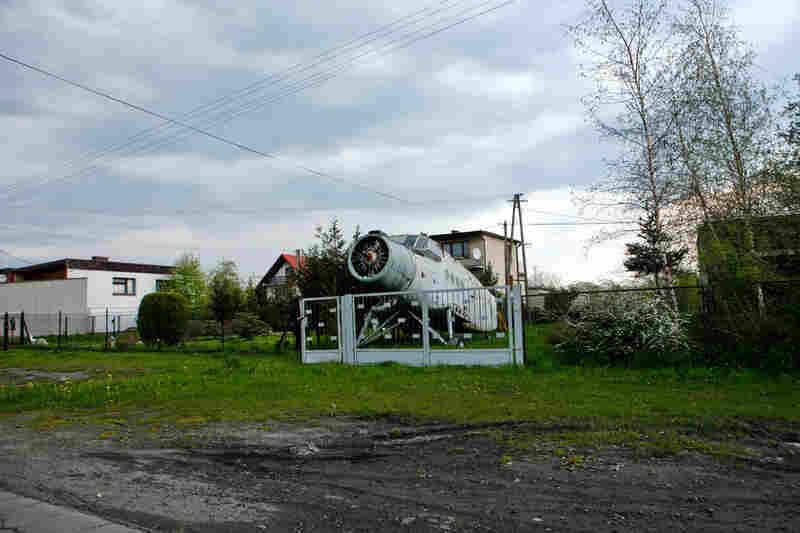 The carcass of a communist-era plane decays in the front lawn of home near Oswiecim. 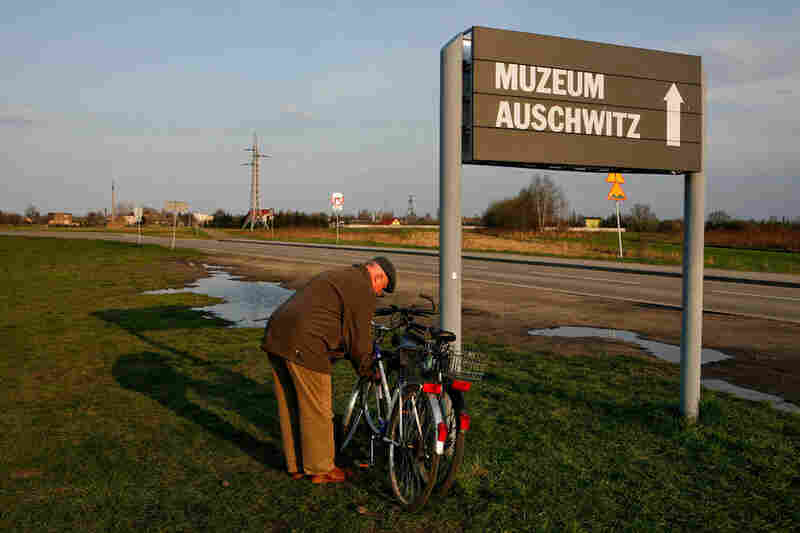 An elderly man from Oswiecim locks his bike to a sign at Auschwitz II-Birkenau that directs visitors to the Auschwitz museum site. 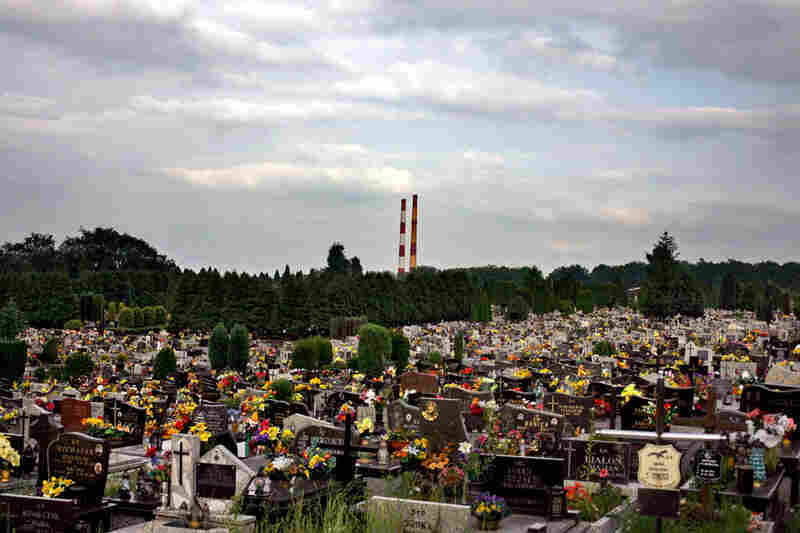 A modern cemetery in the town of Oswiecim, with smokestacks from the town's chemical factory looming in the distance. The factory was built by Nazi Germany during the war and used prisoners from Auschwitz to run it. 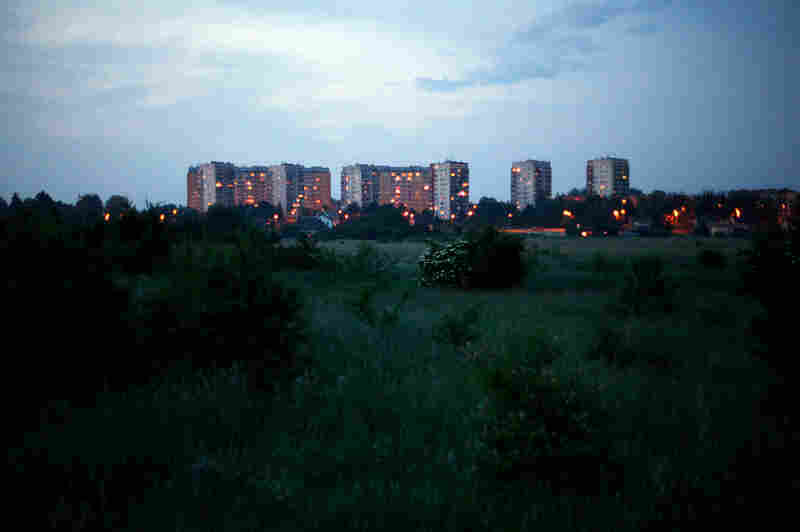 A few high-rise apartment buildings in the center of Oswiecim sometimes referred to as "Manhattan" by residents. Ghitis, Brooklyn-based photographer and grandson of a holocaust survivor, was plagued by that question, and spent some time in 2010 exploring the psyche of Oswiecim — as well as his own. "I was aware of my own strong biases," he writes in an e-mail, "but as a journalist I knew the reality of this town had to be more complex than is often painted." After invading Poland in 1939, the Nazis opened Auschwitz as a concentration camp for Poles and political prisoners; they built the neighboring death camp Birkenau when they implemented plans to exterminate prisoners. And Monowitz was later established as a work camp and chemical plant for Nazi supplies. In the postwar communist regime, with nearly half of Oswiecim residents dead, the chemical industry became a major source of jobs for those who survived and remained in town. The scenes in Ghitis' photos, though modern, seem somehow stuck in history, or lost in time. Today, despite the constant flow of tourism, and despite Poland's flourishing EU economy, "the town's economy sees little gain," Ghitis says. Although what happened on this piece of land was the worst instance of genocide humankind has ever known, the blunt truth is life goes on. It ended there brutally for more than a million innocent people, and we have much to remember and to learn. Nevertheless, for me and for the people of Oswiecim, life must go on.